We hope that 2019 has gotten off to a good start and that you are all doing well! Your farmers have been busy looking to the future of Native Hill and working with PVCF (the land Co-Op) in order to transition to the 40 acre farm at Montava. There is still a lot to work out as we look towards this transition but it is a very exciting opportunity for the farm and more broadly, the Fort Collins community. 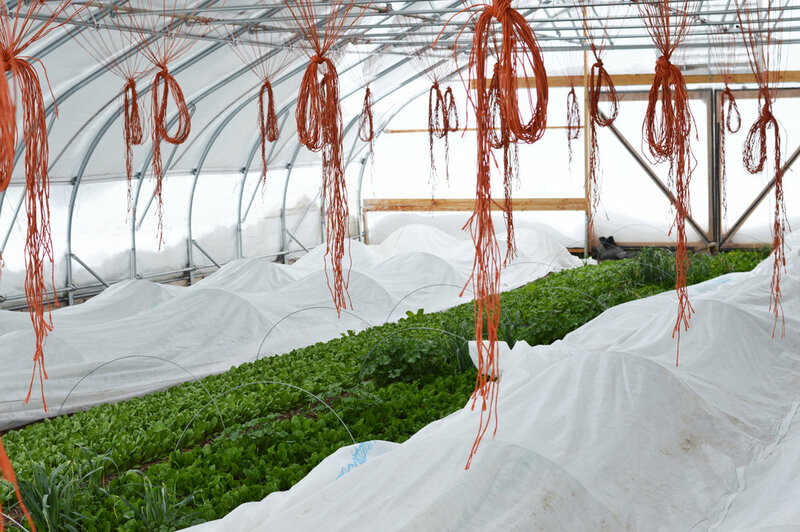 In order to focus on the new farm as well as to give our current farm's soil a MUCH needed break, we have decided to take a year off of growing and selling produce. 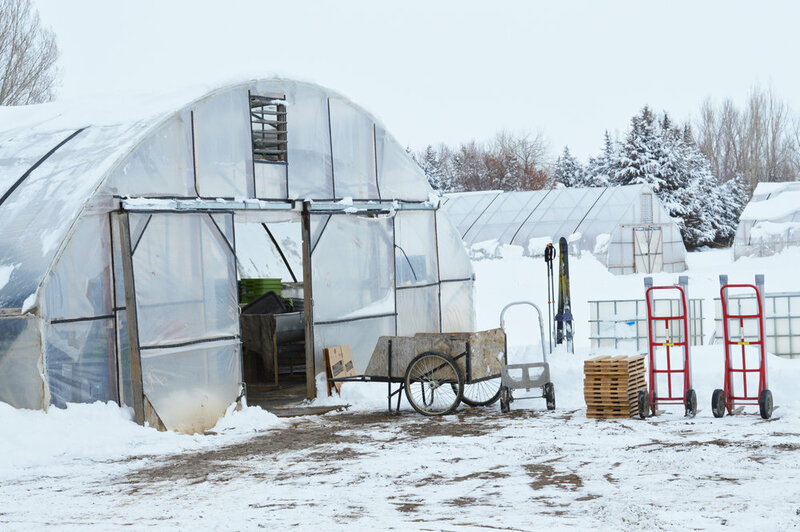 We have gone through many different scenarios to try to keep the farm producing vegetables during this transition year, but in the end, we felt that the best outcome would only come from taking a year off to focus on the future. We need a break from juggling while sprinting. Sometimes you just have to close a road to actually fix it and we hope you see this year as an annoying but necessary detour. Don't worry though, we will still need your help to ensure our success with the new farm. We will be reaching out to you all throughout this strategic planning year with updates and opportunities to get more involved in supporting the transition. We are excited to keep you all engaged as we move forward and there will be moments to give feedback on things that you would like to see happen with Native Hill. We hope you will all view this news as a positive and exciting opportunity for your farm. We LOVE farming and growing food for our wonderful community and we are so looking forward to providing you all with great food again for the 2020 growing season. The best place to find updates will be our website, www.nativehillfarm.com, but please feel free to contact us with any questions that you have in the meantime. Hope you all are enjoying the January thaw and finding things to stave off winter boredom. I always count us lucky this time of year when I hear about winter ice storms and power outages and endless gray days in other parts of the country. Although every region has its challenges, it is lovely to see the sun most of the winter. These last few weeks have been busy with farmer's winter work. Tax prep, spreadsheets, and meetings are part of the every day now and it doesn't make us feel much like farmers. Farm transition has been weighing heavily on our minds these days as we navigate the waters of the potential new farm in 2020. We have the new land leased and currently have it seeded into a winter cover crop but are planning to frost seed 21 types of perennial grasses and forbes in order to rehabilitate the soil and hopefully (fingers crossed) be ready to do some cropping in 2020. It is a large acreage and will probably take a full day on the tractor and that will help us feel like farmers again. It's roasted green chili week! For those of you who are new to the winter CSA, we grow, roast, and freeze Anaheim chilies to save for a distribution in the depths of winter and we are finally there! Coincidentally (or not), chili week always falls on the distribution before Super Bowl Sunday. I can't say that I'm much of a sports junkie, but I don't usually let it stop me from using the occasion for some game time culinary fun. A perfect game day Sunday for me is fill with lots of cross country skiing, a nice sauna and coming home to some type of green chili. There are so many types of chili that can incorporate roasted chilies and I love them all. Think chicken with white beans, oregano, cumin roasted Anaheim chilies and topped with some jack cheese. Don't have chicken? The Homesick Texan has a fantastically easy recipe for Chili Verde Con Carne that I have used at least twice this winter since we happen to have a lot of beef in the freezer. I omit the tomatillos and it is still great. Pork green chili is often a classic and I just happen to know someone selling pork tonight (I will let him know that folks might be asking for shoulder to go with their green chilies), but there are some great vegetarian green chili options too. I often use black beans, sweet potatoes and frozen corn from the summer for this option. Not feeling up for chili? Our green chilies make excellent enchilada sauce. You can make a big batch and freeze the left overs. If you are not ready to use your chilies, they are already frozen and can be happily stored back in your freezer for a few more months. If you are ready to use them, simply pull off the skins, seeds, and stems, but DO NOT RINSE THEM. They will loose a lot of that precious roasted flavor! For those of you picking up at the farm this week, be sure to look for a white cooler that will have your chilies in it. Also a quick reminder to bring back your wax boxes! Nothing better than hearty greens in the dead of winter. I hope you all had a restful and cheer-filled holiday break. The light is coming back and with this unseasonably warm weather, it is hard not to turn our thoughts to spring; however, to keep the anxiety levels hushed here at the farm we are going to live firmly in the present and focus on winter...at least for today. January always feels a bit austere and winter doldrums set in. Restaurants are half full while the gym is packed. I for one sorta like the forced quiet...a time for discipline, a time to start a new routine. It is a nice time of year to have more space to think about meals, to take more time to enjoy the cooking process and make something healthy for you and your family. This week's box has a lot of hearty greens which are perfect for new years traditions as well as resolutions. If you haven't had your black-eyed-peas yet, perhaps pick up a smoked ham hock from Jodar tonight and get on it. Served with a side of wilted collards, you can't go wrong with this new year tradition. In the winter I am always looking for a warm lunch and I have found with a little bit of dinner left overs, I can make something extra delicious and nourishing. This week's will be some left over brown rice and roasted beets thrown into a skillet and topped with some wilted kale and a fried egg. Speaking of kale, we have loose leaf kale this week which is one of my favorite treats for roasting. I do nothing but toss the kale in olive oil and salt and put it on a cookie sheet at 400 for 5-10 min. It gets all crispy and sweet and is so lovely atop almost everything...or just eaten by itself! Please remember to bring your wax boxes back tonight, we can't deliver the vegetables without them! 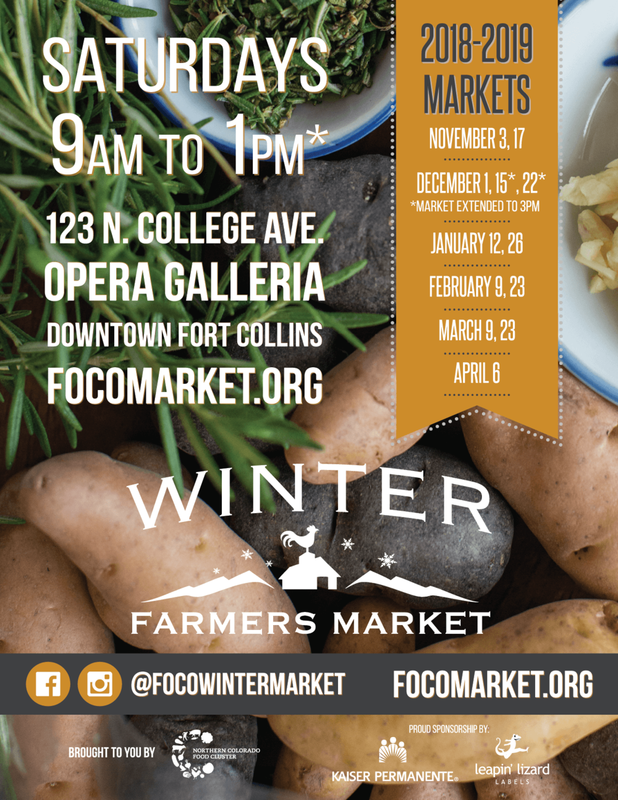 Do your holiday shopping in the heart of Old Town Fort Collins and support local businesses and farms! The Winter Market has over 40 vendors, with a collection of locally made soaps, wine, chocolate, cheese, jewelry and other unique gifts, as well as local vegetables and meats. Come visit the Native Hill stand and all our other friends this Saturday, December 15th and December 22 for fun and festive holiday shopping. We look forward to seeing you then and in the New Year (the Market runs through April 2019!). Eat your Native Hill greens all year long! December is here along with very seasonal temperatures...which is ideal for gathering in a warm, cozy pub, visiting with friends and bringing some light into these dark days. It seems this time of year one must work a little bit harder to escape the gravitational pull of staying home when it gets dark, so really its quite lucky that we all have a reason to be out tonight! Aside from catching up on some socialization, this is the time of year farmers are able to review the summer season, organize the financial picture, and start figuring out how to keep farming another year. In between catching up on the business side of things, we have been prepping fields for their winter's rest and doing some last minute frost seeding before for the ground completely freezes...and of course harvesting greens for y'all. Your boxes this week have all my favorite things to make warm, cozy and gasp, healthy food. After a week of visiting family, there is nothing like coming home to a plant based diet and feeling like all is right in the world again. All I want to eat this time of year is roasted vegetables, which is convenient because we have a lot of roots right now. They are fast, healthy and delicious and the perfect way to make quick meals during the craziness of the holiday event season. Serve them as a side, on a salad, or as the main event over a warm, nutty bowl of quinoa and don't think about it too much. Root veggies in general are not always the most beautiful of the produce world and celeriac might be the oddest looking of them all. For all its ugly, it is actually quite versatile and I for one consider it the work horse of winter cooking. It can be shredded, mashed, pureed or just diced to give your soup or stew that nutty celery flavor. Watermelon radishes are sure to be a hit at any holiday gathering. Aside from a few varieties of tomatoes, they are the only pink vegetable that I know of and really add the "piz-azz" to a winter salad or veggie tray. You can choose to peel them or not but they shine when eaten raw. I like to add them to a good winter slaw with cabbage and carrots or pickle them and serve with Thai food. Just a reminder to please bring any wax boxes lurking in garages, mud-rooms or basements. We need them to keep the veggies goin' round!